Smartphone users are having several benefits like Google Drive, Google Photos and Gmail from Google. These products together provide free 15GB storage. The main idea of offering the Google One app is to unify these three products together, so the users could manage them simply and easily. Apart from them, Google users can contact customer service with one tap. Additionally, some benefits such as Google Play credit and special hotel pricing. To expand total storage some prices have to be paid monthly: 100GB – $1.99, 200GB – $2.99, 2TB – $9.99, 10TB – $99.99, 20TB – $199.99 and 30TB – $299.99. Prices are attractive and can be reasonable for business oriented people who store their data in cloud platforms. First picture shows a man’s review: “pay go app”. In response to that, Google explains that this app has plans from lowest to premium. Second reviewer criticizes Google including CEO or owner in an unfriendly manner. Most probably, the user likes other search engines. 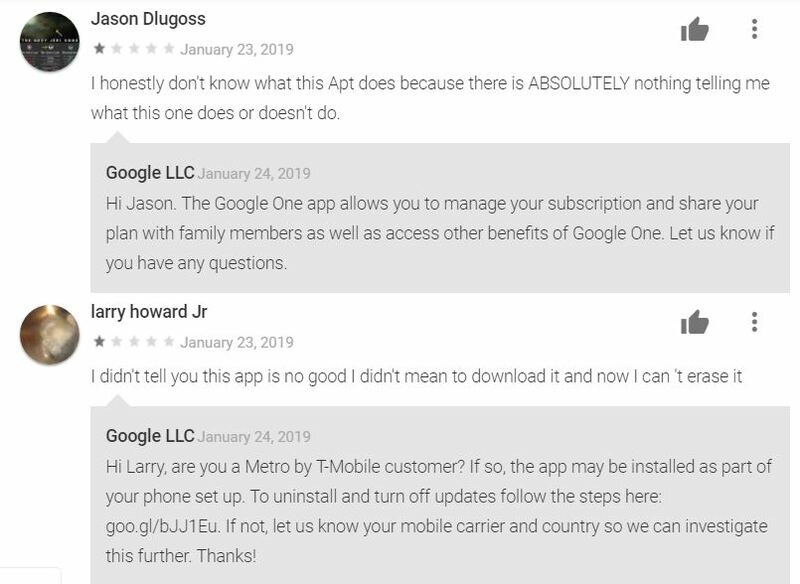 Third and fourth reviewers do not know what functions Google One has and can’t uninstall the app. Last user does not like when the app urges him to upgrade the plan. However, Google responses with an idea stating the user might be T-mobile’s customer and gave a link for reference to fix the problem. The negative reviews above can be changed to positive if Google delivers a clear explanation to frustrated users. Everyone thinks that Google has only free services like Gmail and search engine. Logically, free services of Google are maintained by paid ads and premium services. Soon 4.0 average star ratings may change to max 4.5. It is possible after users realize that Google’s services are transparent in their descriptions. Amazon vs Aliexpress: which is the best online retailer?